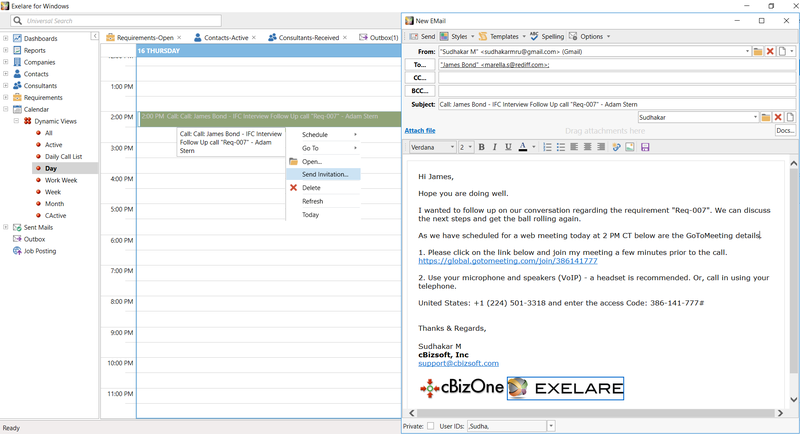 Once an activity has been scheduled on the calendar (Call, Interview, Meeting, Other) users can send an iCal meeting invitation directly from Exelare. The meeting invitation is sent as an iCal attachment which can be read by popular calendar programs such as Microsoft Outlook, Google Calendar and Others. It allows the user to add the meeting details directly to their own calendar. In Exelare, expand Calendar>Dynamic Views> and Click on Day view. An email window pop-ups, with the email address of the Contact or Candidate with whom this activity has been scheduled. The Subject of the Email will also pre-populate with the details of the meeting (taken from the subject of the activity itself). You can change this if desired. Enter any desired text in the body of the email. After composing hit “Send” to send the meeting invite to the recipient.